Animation about Raa Raa, who lives in the Jingly Jangly Jungle. 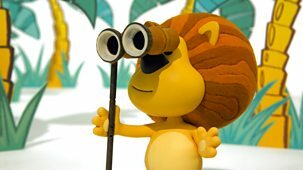 Raa Raa is looking for something new in the jungle but overlooks all the strange new things going on. 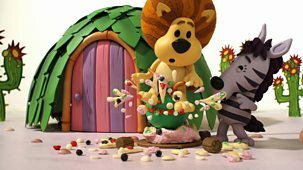 Stop frame animation featuring Raa Raa, who lives in the Jingly Jangly Jungle. Raa Raa and the other animals keep slipping up on banana skins littering the floor. 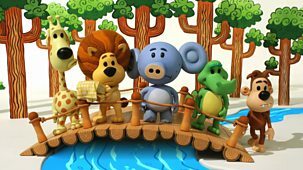 Raa Raa and his friends put on a Jungle show, but with everyone performing on stage, who will watch it? Stop-frame animation featuring Raa Raa, who lives in the Jingly Jangly Jungle. Zebby is upset when Raa Raa laughs at her rumbling tummy and runs off to hide. 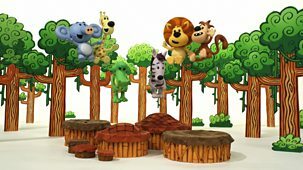 Stop frame animation featuring Raa Raa, who lives in the Jingly Jangly Jungle. Raa Raa finds he has agreed to do too many things in one day. 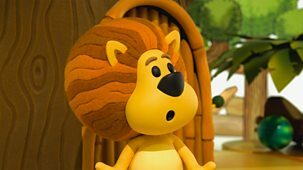 Stop-frame animation featuring Raa Raa, who lives in the Jingly Jangly Jungle. Raa Raa finds a new scratching post, but it is too big and heavy to carry home. 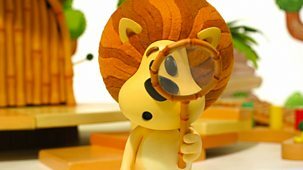 Stop-frame animation featuring Raa Raa, who lives in the Jingly Jangly Jungle. 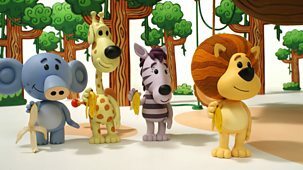 Raa Raa discovers that all his friends come running when he roars really loudly. 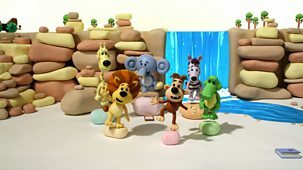 Stop frame animation featuring Raa Raa, who lives in the Jingly Jangly Jungle. 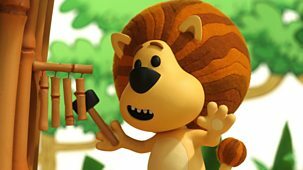 Raa Raa makes Topsy a wonderful present - a noisy set of chimes. 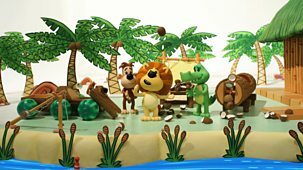 Stop-frame animation featuring Raa Raa, who lives in the Jingly Jangly Jungle. Raa Raa has to make sure that nobody jumps on the musical stones. Stop-frame animation featuring Raa Raa, who lives in the Jingly Jangly Jungle. 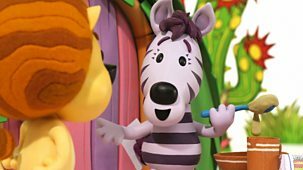 Raa Raa finds an infectious beat, and soon all the animals are joining in. Stop-frame animation featuring Raa Raa, who lives in the Jingly Jangly Jungle. 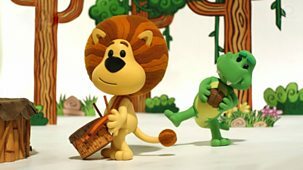 Raa Raa collects fun noisy objects in the jungle with his friends. Stop-frame animation featuring Raa Raa, who lives in the Jingly Jangly Jungle. 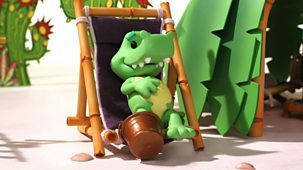 Crocky gets his foot stuck in a bucket and makes lots of noise as he walks. 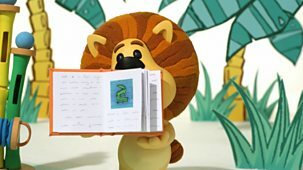 Stop-frame animation featuring Raa Raa, who lives in the Jingly Jangly Jungle. Raa Raa wants to make the noises to go with a story, but they are too loud. Stop frame animation featuring Raa Raa, who lives in the Jingly Jangly Jungle. Raa Raa has got a new pogo stick and has a great time bouncing around. There's a storm in the Jingly Jangly Jungle but no-one is sure what the loud thumps coming from the sky are. Raa Raa sets off to find out. Animation featuring Raa Raa, who lives in the Jingly Jangly Jungle. 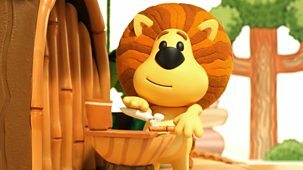 Raa Raa has lost his toothbrush and sets off to find it. Stop-frame animation featuring Raa Raa, who lives in the Jingly Jangly Jungle. Raa Raa wants to find the perfect noise to partner his friend Huffty in a tune. Animation featuring Raa Raa, who lives in the Jingly Jangly Jungle. 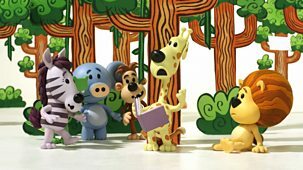 Topsy is trying to read, but Raa Raa and the other animals are all making too much noise. 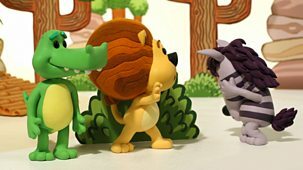 Raa Raa and his friends launch Huffty's whooshy whooshers into the air and lose them in the jungle - but teaming up to look for them can be just as fun as launching them. 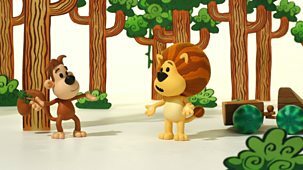 Stop-frame animation featuring Raa Raa, who lives in the Jingly Jangly Jungle. 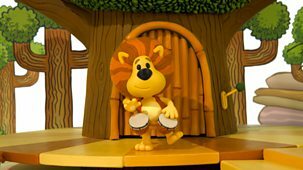 Raa Raa decides that the jungle is not jingly or jangly enough. 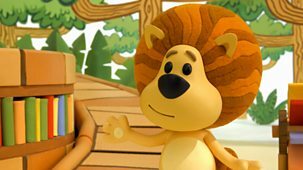 Raa Raa and his friends come up with lots of different ways to say hello to make one cool greeting.